The US Bishops have issued a Statement on Religious Liberty. (H/T Deacon Greg) It is a call to resist unjust laws that, in effect, abolish the freedom of religion. They point out that “ Religious liberty is more than freedom to worship”. They also give concrete examples including, but not limited to, the HHS contraception mandate. Wow. This is a courageous and strong statement from our Shepherds. It is a long statement which defines what freedom of religion is. They also point out that it is not just about Catholics. It is also a call to resist and disobey unjust laws. I would agree with Saint Augustine that “An unjust law is no law at all.” Now what is the difference between the two? How does one determine when a law is just or unjust? A just law is a man-made code that squares with the moral law or the law of God. An unjust law is a code that is out of harmony with the moral law. To put it in the terms of Saint Thomas Aquinas, an unjust law is a human law that is not rooted in eternal law and natural law. But this fight is not a call to take up arms. Our weapon is prayer. In particular, we recommend to our brother bishops that we focus “all the energies the Catholic community can muster” in a special way this coming summer. As pastors of the flock, our privileged task is to lead the Christian faithful in prayer. Both our civil year and liturgical year point us on various occasions to our heritage of freedom. This year, we propose a special “fortnight for freedom,” in which bishops in their own dioceses might arrange special events to highlight the importance of defending our first freedom. Our Catholic institutions also could be encouraged to do the same, especially in cooperation with other Christians, Jews, people of other faiths, and indeed, all who wish to defend our most cherished freedom. We suggest that the fourteen days from June 21—the vigil of the Feasts of St. John Fisher and St. Thomas More—to July 4, Independence Day, be dedicated to this “fortnight for freedom”—a great hymn of prayer for our country. Our liturgical calendar celebrates a series of great martyrs who remained faithful in the face of persecution by political power—St. John Fisher and St. Thomas More, St. John the Baptist, SS. Peter and Paul, and the First Martyrs of the Church of Rome. Culminating on Independence Day, this special period of prayer, study, catechesis, and public action would emphasize both our Christian and American heritage of liberty. Dioceses and parishes around the country could choose a date in that period for special events that would constitute a great national campaign of teaching and witness for religious liberty. In addition to this summer’s observance, we also urge that the Solemnity of Christ the King—a feast born out of resistance to totalitarian incursions against religious liberty—be a day specifically employed by bishops and priests to preach about religious liberty, both here and abroad. To all our fellow Catholics, we urge an intensification of your prayers and fasting for a new birth of freedom in our beloved country. We invite you to join us in an urgent prayer for religious liberty. For freedom you have set us free in Christ Jesus (Gal 5:1). the foundation of human rights, justice, and the common good. 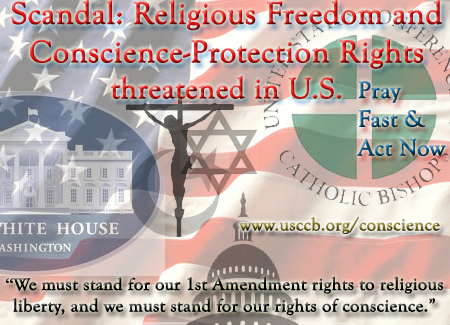 This entry was posted in Catholic Church, Church and the Public Square, Freedom of Religion and tagged United States Conference of Catholic Bishops. Bookmark the permalink.